“William McKinley and His America” by H. Wayne Morgan was published in 1963. Morgan was a noted historian of the Gilded Age, an author and a history professor for nearly three decades at the University of Oklahoma. Morgan died in 2014 at the age of 79. The underlying theme of Morgan’s biography is that McKinley was a strong but compassionate transitional figure, pivoting the presidency from the Gilded Age to the modern era of politics. And while admitting that McKinley was not a “great” president, Morgan seems to suggest he fell not far from that category. Despite the book’s title it is far more a biography of McKinley than a history of his times (or “His America”). This stands in contrast to Margaret Leech’s earlier biography of McKinley which is at least as much the latter as the former. But historical context is never in short supply and the reader never loses sight of important events outside McKinley’s immediate sphere. Though lengthy at 530 pages, this biography is well-paced, nicely balanced and surprisingly interesting. The various periods of McKinley’s life each receive reasonable coverage; his pre-presidency (including his childhood, legal and congressional careers and terms as governor of Ohio) accounts for about half the book. And although there is relatively little focus on McKinley’s family life, his children died in early childhood so, other than his conspicuous devotion to his frail wife, politics was his life. While Morgan’s writing style lacks elegant flourishes it is direct, impactful and easy to understand. There are no hidden messages to decode or important themes uncover. He demonstrates an uncommon talent for explaining complex (or dull) issues in remarkably comprehensible language: his introductions to the Cuban conflict and the tariff issue were among the best I’ve seen. The author also does a nice job analyzing McKinley’s personality, dissecting it into the various character traits which assisted in his political ascension and differentiated him from his contemporaries. Morgan’s portrayal of McKinley is neither overly sympathetic nor particularly harsh. But I was struck by his willingness to forgive McKinley for his failure to prepare the military for the conflict with Spain and for his miserable choice of Sherman as secretary of State. Other notable features of this biography are an engaging discussion of McKinley’s 1896 presidential campaign and an interesting review of McKinley’s cabinet selection process. And Morgan ends the book with a useful review of McKinley’s presidency and the attributes which lined his path to political success. But disappointingly there is less emphasis on McKinley’s legacy or place in history (even from the author’s dated vantage point) than I would have liked. Morgan’s biography is also about 10-20% too long. There were relatively few occasions when the text became bogged down, but with careful pruning (perhaps 50-100 fewer pages) this biography could be even more compelling. Embedded footnotes and a bibliography would also enhance the book. 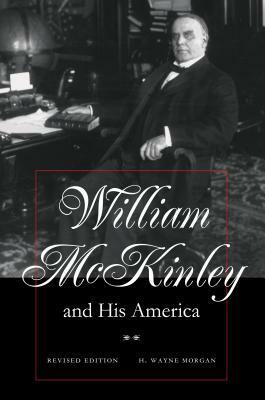 Overall, H. Wayne Morgan’s “William McKinley and His America” is a creditable biography of an arguably under-appreciated president. This book proves comprehensive, balanced, interesting and incredibly straightforward. Readers with an interest in William McKinley will almost certainly find this a rewarding and worthwhile journey. Thank you for the great review! This is one of those books I’d like to read, but the $50 price range for a hardcover is a bit pricey for me right now. Keep up the great work! I recall this being one of my more expensive presidential biography purchases, but was surprised to see after reading your comment that its cost has nearly doubled in the past year. Ouch. Reblogged this on History Book Reviews. 1st Edition – William McKinley and His America by H. Wayne Morgan (1963) – note there are two editions. This seemed curious, as a President’s personal secretary almost always has special insights into the office. This was also the first typographical error I came to, as George Cortelyou’s middle initial is B (Bruce). President Cleveland hired Cortelyou as his chief clerk. On Cleveland’s recommendation, McKinley hired Cortelyou as his personal secretary (after using Porter for the first 2 yrs unsatisfactorily). After McKinley’s assassination, Roosevelt asked Cortelyou to lead an effort to reorganize the White House and later appointed him to the position of Secretary of Commerce & Labor. He left that position a year later to become the Chairman of the Republican National Committee, and starting in 1905 he also served as the Postmaster General. He left both of those positions to become Secretary of the Treasury. After Roosevelt left office in 1909, Cortelyou became president of the Consolidated Gas Company. Thus not an insignificant actor in the politics of the era. My evaluation of the 1st edition biography is based on the other two dozen POTUS bios I have read (one per President), and not compare it to other bios on McKinley by different authors as Steve Floyd has done. So how does this stack up to what is a good biography of a POTUS? Criterion were simple – did I learn deeply about who McKinley was as a person, and did I learn and appreciate who he was in context to America and U.S. politics? Omissions in details occurred in the book. Example, the full (short) letter McKinley sent to Rutherford Hayes, inviting him and his wife to the wedding between William McKinley and Ida Saxton to be held Jan 24, 1871 is quoted. Yet biographer Morgan does not say whether the Hayes actually attended. The digitized version of the The Stark County Democrat. (Canton, Ohio), January 26, 1871 [ref2] reports the marriage occurred Jan 25th. (not the 24th as McKinley wrote in his letter to Hayes and which Morgan ascribed the wedding date). p.49 “her neighbors whispered that she had “fits”” [the term then used to describe seizures], and “She took bromides to sleep” [the only medical treatment for seizures in 1871]. Her condition while First Lady is better elaborated on p.311. As readers of POTUS bios know, family and wife are especially important to the development and motivations of the President (Mrs. Lincoln anyone?). Morgan paints with too broad a brush. For example, p.98-99 on the issue of then President Cleveland issuing a poorly thought out proclamation to return captured Confederate flags to Southern states, and Ohio’s Governor Foraker refusing to follow this order. Morgan states “McKinley was said to remark that he ‘was a great deal more concerned about the enforcement of constitutional provisions that he was about what should be done with rebel flags’ which netted Foraker.” Delving into the details of McKinley’s thoughts and positions on these issue is exactly what one should expect in a POTUS bio, but Morgan does not seem competent enough to provide the reader with this information, either through lack of research or lack of understanding of what the topic requires. Another example would be the McKinley tariff bill. Complex, full of compromises and graft, the hot topic of the new Republican House of Representatives. Moran alludes on p.132 “Widespread dislike of the sugar trust prevailed; McKinley himself had tangled with its agents”. Here would be the place to get specific as to McKinley’s entanglements, provide actual quotes about his true feelings and the people and industry he interacted with. Instead, Moran gives his own digested interpretation of events rather than allow the reader to draw his own conclusions from the raw facts as might have been recorded in letters, diaries, Congressional notes and speeches. A not to uncommon failing in many POTUS bios is the assumption by their author that the reader already knows the important characters. Not unjustified for some readers like this group who are reading the biographies in chronological order and thus are accumulating names, places and background. But the book should stand on its own. Thus when McKinley is formulating his position on the gold versus silver standard running up to the 1896 Republican nomination, p.212 “Reid showed the draft to J. P. Morgan and others without revealing its author [McKinley], and Morgan’s response was somewhat cool.” The reader might rightly assume that J. P. Morgan was an important banker. But how important, and particularly so regarding gold? This is not explained (although it is well described in Allan Nevins’ Grover Cleveland: A Study in Courage, 1932). It would have significantly improved the McKinley bio if a few sentences were added explaining that in 1895 the Federal Treasury was nearly out of gold and that J. P. Morgan put forward a plan for the federal government to buy gold from his and European banks and that it was declined in favor of a plan to sell bonds directly to the general public to overcome the crisis. J. P. Morgan, sure there was not enough time to implement such a plan, demanded and obtained a meeting with President Grover Cleveland where he claimed the government could default that day if they didn’t do something. J. P. Morgan came up with a plan that allowed Morgan and the Rothschilds to sell gold directly to the U.S. Treasury, in exchange for a 30-year bond issue. The episode saved the Treasury but hurt Cleveland’s standing. Again, no small actor but skipped over. Perhaps the author felt 530 pages of biography was already too long and couldn’t flesh everything out. At this point we are nearly halfway through the book, and my review itself is getting too long to read. McKinley’s Presidential election campaign, cabinet choosing, and time in office is well covered. The chapter “Presidential Profile” goes away in redeeming lost opportunities for the author to dig into McKinley’s character. Yet the several chapters on Cuba and the Spanish War have the character of President as a bystander. There was no mention of his Supreme Court nomination of Joseph McKenna, or any serious discussion of the role the Supreme Court played during his administration.